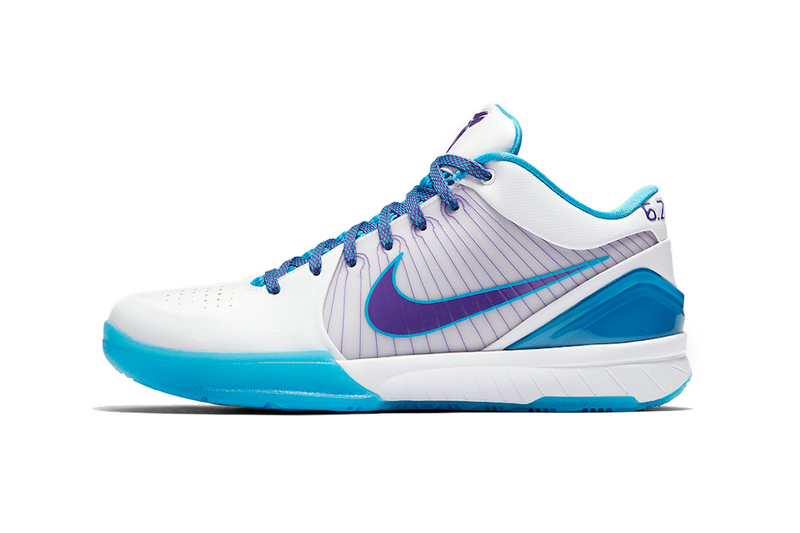 Back in 2009, Nike released the Zoom Kobe IV - its first low cut basketball sneaker since the Nike Bruin in 1972 – which would change the outlook of low-cut sneakers on the hardwood. This year its “Draft Day” colorway will be making a return in an upgraded Protro version similar to previous releases we’ve seen of the Kobe 1. Inspired by the Charlotte Hornets, you’ll find a mix of light blue and purple on a white based to coincide with the team that originally drafted the legendary Laker. The colorway is completed thanks to Kobe Bryant‘s signature logo on the tongue and ”6.26.96” stitched on the heel as an ode to the day Bryant donned the traditional draft cap. The Nike Zoom Kobe 4 “Draft Day” will appropriately release during this year’s NBA All-Star Weekend festivities in Charlotte on February 15 via select Nike Basketball stockists, Nike.com and Nike SNKRS. Those looking for more launches during All-Star weekend can also take an inside look at Nike and Jordan Brand’s reveal in Atlanta’s TNT Studios. Modeled after its signature aluminum luggage.